Alaska Parent | Features | Let's Dance! Children have a natural desire to move – they’re all over the place, jumping, running and even dancing to their own rhythm. Dance classes are a good way to corral all that energy into a discipline that is also an outlet for self-expression, creativity and imagination. Dance education is a great option for children who are not drawn to team sports, but whose parents still want them to be active and healthy. The benefits of dance on childhood development – from tots to teens – are definitely worth exploring. For preschoolers, dance “develops motor skills, coordination and rhythm, and teaches them how to explore different movement with their bodies,” says Philip Krauter, artistic director of Juneau Dance Theatre. 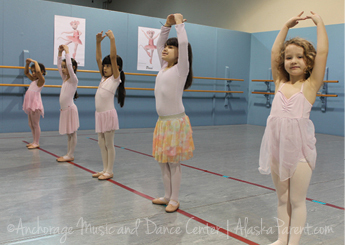 This “creative movement” opens the doors for preschoolers to “use their imagination and learn an appreciation of their bodies and their own capabilities,” says Eileen Spezialy, owner of Anchorage Music and Dance Center. Dance class also helps little ones learn how to work together within a group – a useful skill before starting school. “They learn how to interact with others and how to cooperate,” she adds. Dancers can even get a leg up on math, notes Charlotte Truitt, mother of four dancers ranging in age from 10 to 18. “My kids’ math tutor said that dance is beneficial to building math skills. They’re learning to think spatially and geometrically because they are building patterns through the choreography. And, they have to learn how to count in beats of four, six and eight while moving their body.” In Alaska, dance has another plus: “It is a wonderful indoor activity,” says Truitt, especially during cold and rainy days. Some children, especially boys, take classes to increase their flexibility and balance, which helps them in a variety of sports. 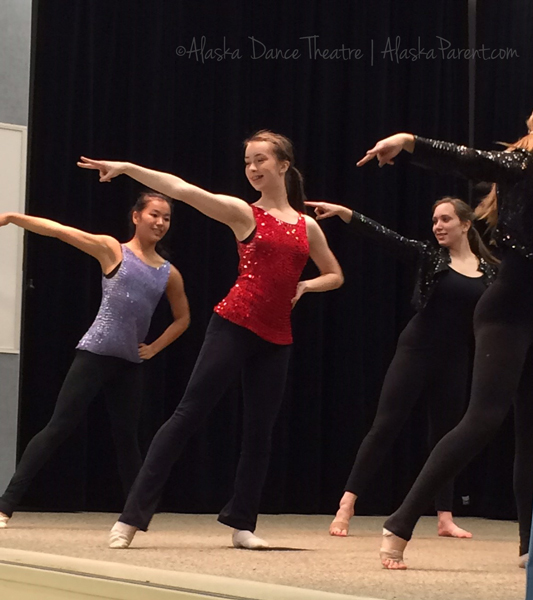 Both Juneau Dance Theatre and Alaska Dance Theatre offer scholarships specifically for boys. “I try to recruit as many boys as I can,” says Krauter. Dance can be uniquely beneficial for teenagers. “Today with the proliferation of electronics, teens are always on their phones. They’re not present. Kids who dance are very present,” says Truitt.